France, 2010, 105 minutes, Colour. Gerard Depardieu, Benoit Poelvoorde, Dominique Blanc, Melanie Thierry, Catherine Mouchet. Alexandre Dumas, pere's, life may not have been exactly the same as the adventures of the three musketeers or the count of Monte Cristo nor had the connections with royalty as his tales of Queen Margot or Louis XIV. However, this part portrait, part adventure, does bring something of the excitement that he put in his pages. 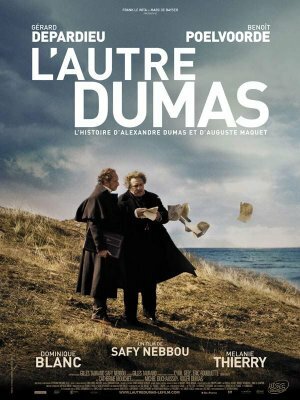 Who better to be Dumas, a larger than life, flamboyant character, than Gerard Depardieu. As always, he so inhabits his character (usually looking the same but here he has a frizzy hairdo) so that we believe he is Dumas. He is excellently counterbalanced by Benoit Poelvoorde as Dumas' writing partner, August Maquet who can be called the 'other' Dumas since he may have written far more of Dumas' work than he has been credited with. The picture of their collaboration in ideas, plot development and writing is intriguing. Later Maquet was to sue Dumas and was awarded 25% of authorship but was not allowed any explicit credit, finally buried in a pauper's grave while Dumas was eventually interred in the Pantheon. How much of the adventure side of this film is fact? Who knows? There is a Dumas' plot device where a young woman (Melanie Thierry) mistakes Maquet for Dumas and enlists his help to petition for freedom for her imprisoned father. Maquet is smitten, prepared to give up everything for her. There are home complications, property-selling complications, republican and monarchist complications. There is a network of spies and some revolutionary activity. The identity issue is resolved at a lavishly costumed banquet and dance. And Dumas and Maquet, after angry interchanges, return to their writing. A colourful re-creation of 19th century France and an entertaining tale. 1.The status of the Dumas novels? The many films from these novels? French history, adventure, swashbuckling, intrigue, deceptions, royalty? The Musketeers? Their popularity in the 19th century? Dumas and his popular reputation – later being buried in the Pantheon? Audience knowledge of Dumas stories? 2.19th century France, the 1840s, post-revolution, post-barricades, the established monarchy? Dumas and his past rebellion? The overthrow of the king? Time passing? The older Dumas, settled in his way of life and reputation? 3.The introduction to Dumas and Maquet, on the boat, Maquet ill, Dumas taunting him about food? In the town, acclaim for Dumas, the hostess, the women, everybody praising him? The illiterate woman saying she had read his book? His womanising and style, bravado? Maquet as quiet, the writer? Dumas wanting to change rooms for the sea air – and the ironic consequences? 4.Charlotte’s arrival, mistaking Maquet for Dumas, pouring out her heart, Dumas’ past history, comrades? Maquet trying to explain, then not explaining? Being smitten, his promises to Charlotte? His visit to her house, the rain, his intentions? 5.Maquet wanting to leave the town, composing a letter from Charlotte for Dumas, the return to Paris? Dumas’ household, Celeste and her being secretary, her relationship to Dumas? His ex-wife and her suing? Putting the correspondence in the bin? Reading Charlotte’s letter, Maquet listening? Maquet’s plea? Acting on it? 6.Maquet at home, his relationship with his wife, family, the children? At table? The visit of the sub-prefect? The question of the sale or not of the house? The discussions? 7.Maquet and his change of heart, selling the house, going to see Charlotte, the plea for her husband to be released? 8.The political background, the plots, the minister, the agents and spies, the bribes and promotions? 9.Dumas and his writing, method, plot, walks, his memory, turn of phrase? Maquet as collaborator, his skills? Upset at Dumas’ referring to himself as the author rather than “we”? 10.Maquet and the discussions with Celeste, going to her apartment, Charlotte, her fiancé, bringing in the guns, Maquet waiting, the return? 11.Celeste and her agreement, her being upset with Dumas, believing that he had set up Charlotte, arranging the party, Charlotte to be addressed as the queen? 12.The party, lavish, the fancy dress, Maquet as Cardinal Mazzarin? Not wanting to go, sick and retiring, his wife wanting to go? His being amazed at Charlotte? Meeting her, Charlotte and the truth, slapping him? 13.Dumas and his ridiculous costume, flamboyant, Charlotte ridiculing him? Her friendship with Celeste, her discovery of the truth? 14.Charlotte, upset, going to Paris? Dumas and his promises? Maquet and the letter? The sub-prefect and his intervention? 15.The prefect, coming to the party, his secretary disguised, spying? 16.Paris, Maquet, Celeste and her being arrested, Dumas being arrested, the doctor and his illness, his death before release? 17.The protesters outside the prison, invading the prison, everybody free, the swashbuckling fights, the deaths? 18.Maquet and Dumas, their arguing about authorship, Dumas owing so much money to Maquet, the issue of suing? 19.The collaboration, the “we” – but in fact, the court case, in favour of Dumas, Maquet and his poverty burial?